“I was a bit of a knucklehead,” says Billy. 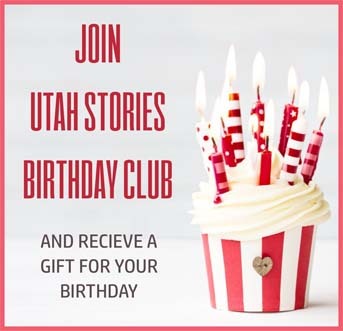 He’s co-owner and sushi chef at Hamachi Pescatarian Grill & Sushi Bar, and he’s explaining how he came to live in Utah. In short, he was incorrigible, acting out, and his mother shipped him off from Chicago to the Beehive with the thought that he’d clean up his act here. He did. Billy is originally from Mongolia, and only moved to the USA when he was twelve, knowing no English. It was a difficult transition, to say the least. But so far at least, his story has a happy ending. At the mere age of 25, he has opened his own restaurant. Billy works extremely hard and expects those around him to do the same. 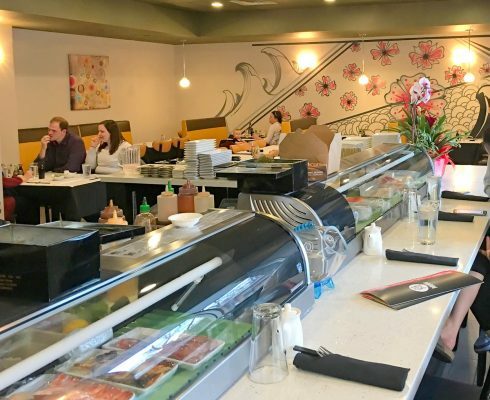 Billy’s sushi training began when he was 16, making sushi rice in Park City restaurants Yuki Yama and Shabu. 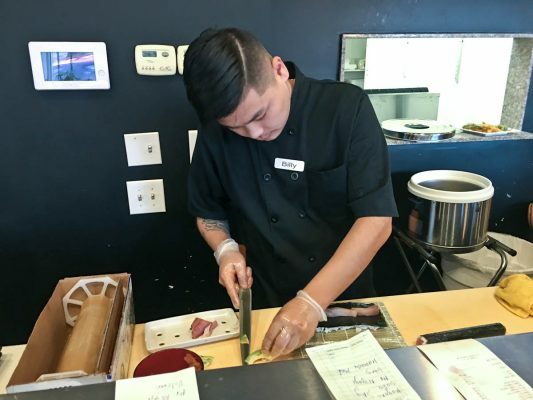 It didn’t take long for employers to recognize his work ethic, and before long he was learning the art of making sushi. Watching Billy with a sushi knife is mesmerizing. Oh, if I could only handle an avocado the way he does! To hear Billy talk about having a deep respect for the sushi-making tradition, it’s hard to believe he’s only 25. He’s seems wise beyond his years. “I really wanted to play basketball, and I was good!” he says. But no one wanted to draft a not-so-tall Asian kid to play college basketball, so attending a university wasn’t an option. Maybe finding the way of sushi was meant to be for Billy, because this kid has skills. Hamachi is a bright, colorful restaurant with a small, but very friendly staff. Although it’s only been open a short time, there are already “regulars” and Billy seems to know all of their names. He’s an affable guy and after my wife and I bellied up to the sushi bar, we chatted with him throughout our entire meal. Which, by the way, was an excellent one. You wouldn’t be disappointed with a chef’s special like Hamachi carpaccio ($17.95), a pretty presentation of thin-sliced yellowtail, lightly seared with sesame oil, green onion and jalapeño, drizzled with ponzu sauce. 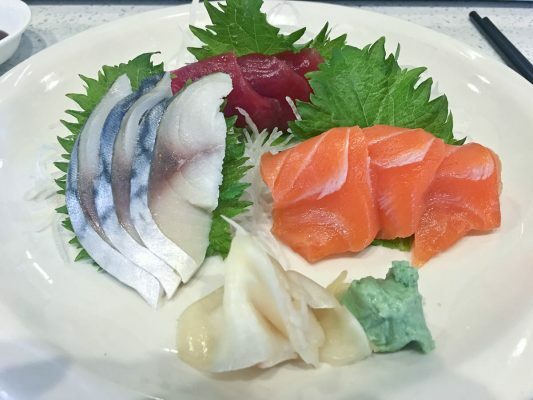 I always like to start “light” at sushi restaurants, so we first enjoyed the small sashimi combination – nine pieces of fresh, raw fish served with daikon threads and shiso leafs ($17.95). The chef’s choice combo that night was three pieces each of sake (salmon), saba (mackerel) and deep, blood-red colored maguro tuna. Small things matter, like our sashimi coming with freshly sliced ginger alongside, not the artificially-colored pink stuff that comes in jars. 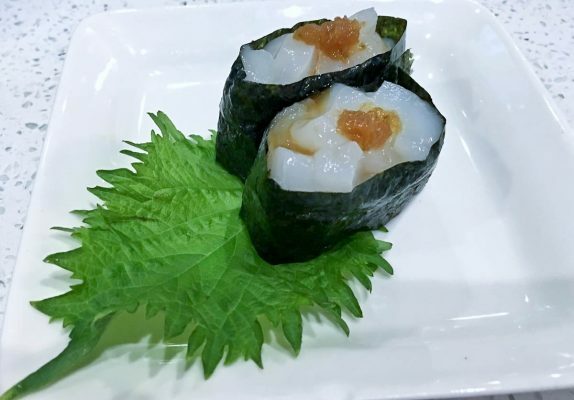 Next up was nigiri: we ordered hamachi (yellowtail), tuna and hotategai, and especially enjoyed the latter: minced raw scallops in a seaweed wrap ($4.50/two pieces). 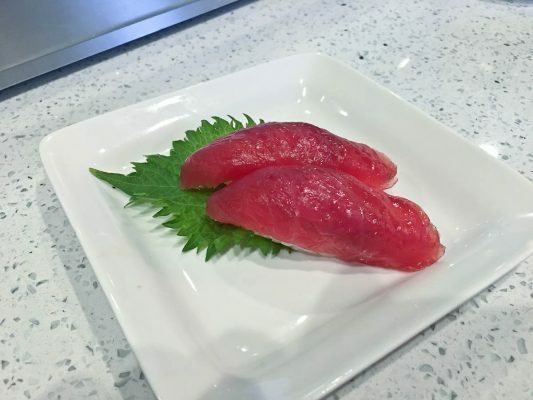 Nigiri – a thumb-sized dollop of vinegared sushi rice usually with a slice of raw fish on top – is deceivingly simple. The fresh fish must be of the very best quality and the rice has to also be perfect. There are no sauces or additional ingredients to hide behind. 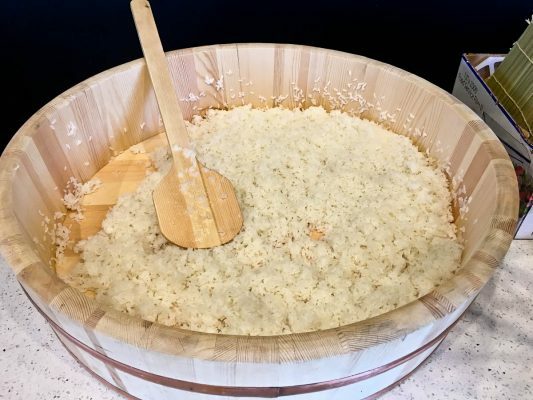 You certainly won’t find quality rice and seafood at the all-you-can-eat or two-for-one or happy-hour-sushi joints that abound here in and around SLC. At Hamachi, you get the real deal. Between nigiri courses, Billy brought out a whole hamachi and proceeded to “break it down” right in front of us. It’s one thing I love about sitting at a sushi bar: there’s entertainment and a show to go along with the great food. 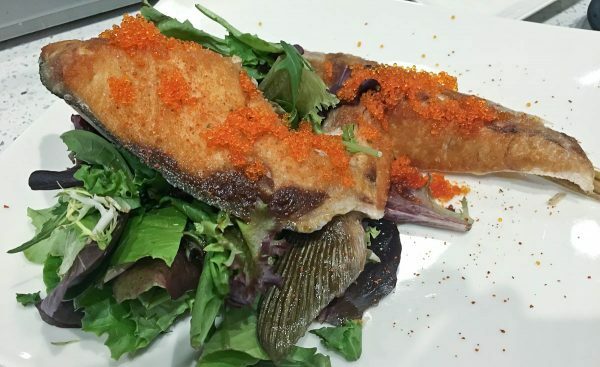 Anyway, he sent the hamachi cheeks back to the kitchen, and the next thing we knew we were eating hamachi kama – deep-fried hamachi collar covered with tobiko – all gratis. It was a very nice gesture and a really delicious treat. Too bad it’s not on the menu, since each fish just has one collar. Lucky us! Sitting at the sushi bar, we noticed an abundance of one particular sushi roll being ordered by customers. Obviously, it was a crowd favorite and so, we had to try it as well. 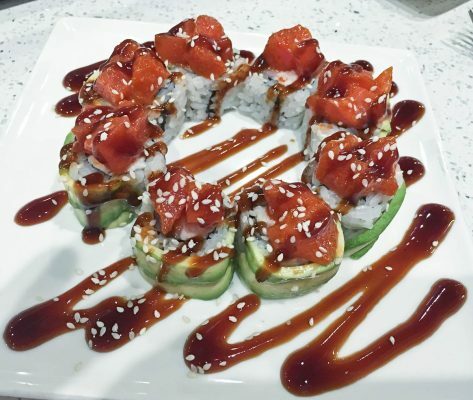 It’s a roll that Billy created – the Mr. Miyagi roll – named for Mr. Miyagi in The Karate Kid. We joked that Billy was far too young to have seen The Karate Kid, but he says it’s one of his favorite films. Like I said, this kid is old and wise beyond his years. The Mr. Miyagi roll ($10.95) was stupendous; one of the best sushi rolls I’ve eaten anywhere, and that includes highfalutin places like Nobu in Vegas. 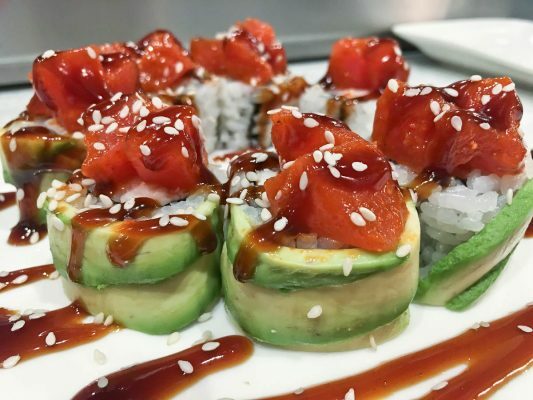 The roll is a mix of yellowtail and crab salad which is wrapped with avocado, and topped with tuna mixed with sesame oil, scallion, sriracha, togarashi and eel sauce. Wow! It’s gorgeous to gaze upon and even better to eat. Kids these days… They don’t get much credit. We think they’re lazy and addicted to iPhones. But meeting a young man like Billy and indulging in his sensational sushi gives me great hope for the future. It takes hard work to run a restaurant, but Billy and his staff seem to have all the right stuff. Check Hamachi out. 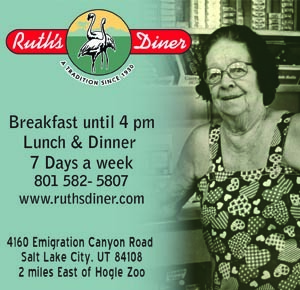 It’s a small, undiscovered gem on the SLC sushi scene, but it won’t stay that way for long. Do you have a favorite sushi roll? Let us hear about it.